CDI is continuously developing public awareness efforts and opportunities for our members to seek media recognition in their local communities that range from sponsored national holidays to free booths at job fairs. 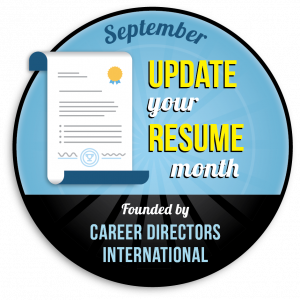 In 2000, CDI proclaimed September the official “Update Your Resume Month”, registering the event as a national holiday with Chase’s Calendar of Events. September is the perfect time to start a new approach to career care-taking. While children are embarking on starting the new school year, adults should also be taking stock of their professional attributes and career value by updating their resumes. By declaring September as the official update month, people will have the opportunity to better control and champion their own futures. CDI encourages career professionals and other helping organizations worldwide to promote the initiative to job seekers through free educational resources such as webinars, workshops, resume critiques, teleseminars, and published articles/blog posts. It is a great opportunity for press coverage and for making a difference! Promotional e-banners are available to anyone but members can also access numerous additional marketing materials in the member’s section. International Update Your References Week, is CDI’s officially designated event that takes place each year during the first full week of May. It is also an officially registered event with Chase’s Calendar of Events. This event was created due to the importance of job seekers learning to maintain a network of warm contacts and references, in order to assist them in career change, employment, and growth. CDI encourages career professionals and other helping organizations worldwide to promote the initiative to job seekers through free educational resources such as webinars, workshops, teleseminars, and published articles/blog posts. It is a great opportunity for press coverage and for making a difference! Members can also access numerous additional marketing materials in the member’s section. Volunteers For Careers™ was spearheaded by the Professional Resume Writing and Research Association (now Career Directors International) in a collaborative effort with all other career professionals throughout the world to assist those affected by the tragedies of September 11, 2001 as well as Hurricane Katrina in 2005. Throughout the industry, the Volunteers For Careers™ program allows career professionals to donate services (Resume Writing, Cover Letter Composition, Career Coaching and Job Lead Assistance) to provide relief and assistance. To date, several hundred career professionals have banded together to provide assistance to thousands of job seekers. Currently, Volunteers for Careers™ is inactive, but could be reactivated at CDI’s discretion.